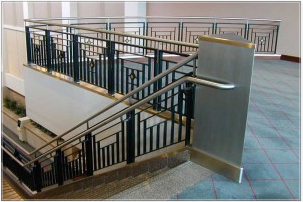 Couturier’s manufacturing process for railing systems is specially designed to meet the needs of staircase railing designs with decorative metal railings. 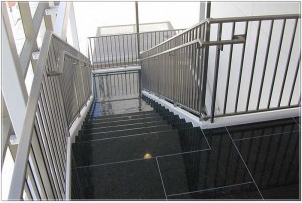 Design options for railings for stairs are numerous and include aluminum railing, steel railing, stainless railing, cable railing, glazed decorative metal railings and iron handrails. 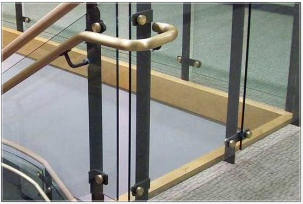 Our non-ferrous metal railing components are designed for 1/2″ tempered glass with polished exposed edges. Other glass thicknesses are available upon request or as required, along with laminated glass, plexi-glass and custom etchings for even more detail. 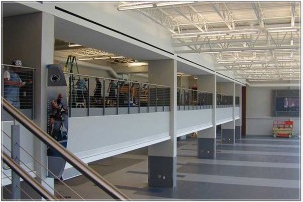 As with our stairways, all railing systems and their components are fabricated in-house insuring the entire process is controlled by collaboration within our own team leading to seamless communication and execution. Mi. Catholic Conference Bldg. Lansing, MI. 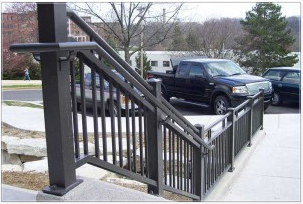 Painted Aluminum Guardrails With Custom Infill Panels. Allegan Street Parking, Lansing, MI. 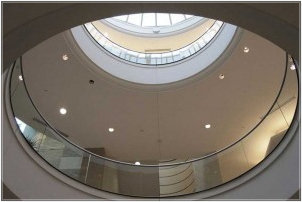 Oval Cap Aluminum Fully Welded System with Powder Coat Finish 7,000 Lin. Ft.
Barton Malow Headquarters, Southfield, MI. 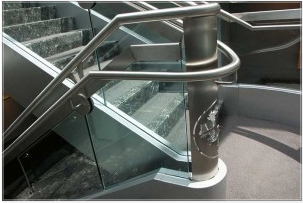 Tempered Glass and Stainless Steel Railings. Bronson Methodist Hospital, Kalamazoo, MI. 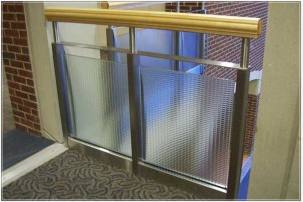 Ornamental Ssttel Painted Railings with Glass Panels. 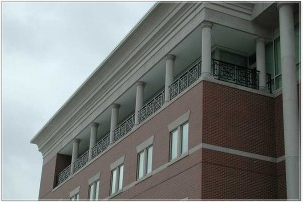 Farmington State Bank, Farmington, CT. Tempered Glass Railings with Wood Cap and Brass Handrails. 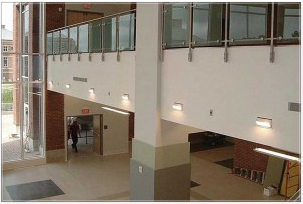 Georgia Southern University, Statesboro, GA. Tempered Frosted Glass and Stainless Steel Railngs. Grosse Pointe Public Library, MI. 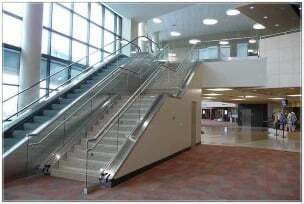 Scalloped Tempered Glass & Stainless Steel Railngs. Haworth Corp. Headquarters, Holland, MI. 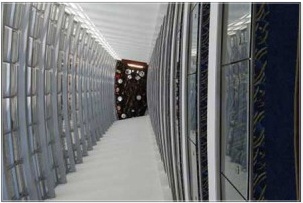 Temered Glass Railngs with Stainless Steel Groove Tube Cap. Holland Hospital, Holland, MI. Stainless Steel with Patterned Glass and Wood Handrail. Kalamazoo/Battle Creek Intl. Airport, Kalamazoo, MI. 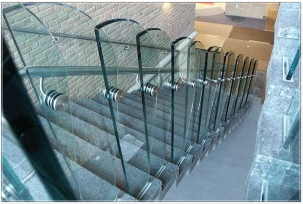 Tempered Glass Railings with Stainless Steel Handrail and Stainless Steel Cap Rail. Lansing Center, Lansing, MI. 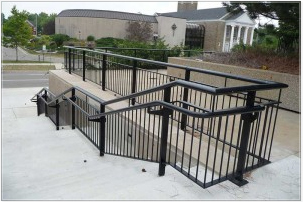 Ornamental Iron and Stainless Steel Railings. Little River Casino Resort, Manistee, MI. Custom Hotel Balcony Railing with Sunburst. 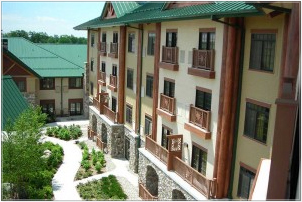 Little River Casino Resort, Manistee, MI. Wrought Iron Picket Railings with Wood Top Cap. Marriot Hotel, Grand Rapids, MI. 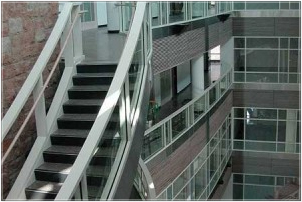 Tempered Glass Atrium Railngs. Marriot Hotel, Grand Rapids, MI. 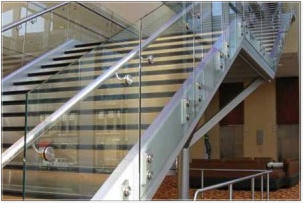 Tempered Glass Railngs on Stairway and Balcony. Marriot Hotel, Grand Rapids, MI. 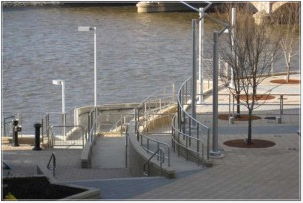 Stainless Steel Cable Railings. Michigan Opera House, Detroit, MI. 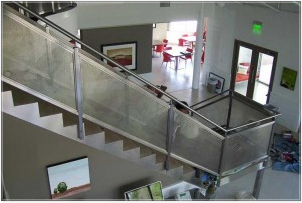 Custom Stainless Steel Railings. Michigan State Housing Development Authority Bldg. 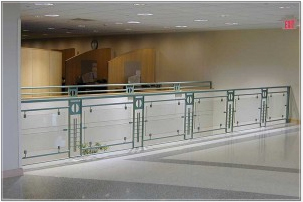 Ornamental Tempered Glass and Stainless Steel Railings. Nusoft Solutions, Cascade, MI. 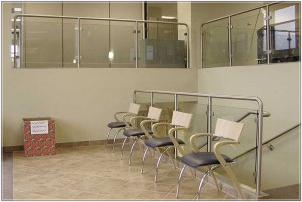 Custom Stailess Steel and Glass Railings. (Stairway by Others). Oakland University, Rochester, MI. 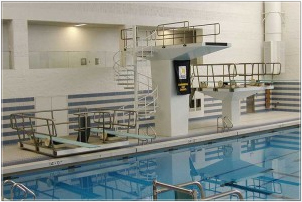 Spiral Staircase, Stainless Steel & Glass Railings at Pool Area, Glass & Wood Rails at Commons. Oaklawn Hospital, Marshall, MI. 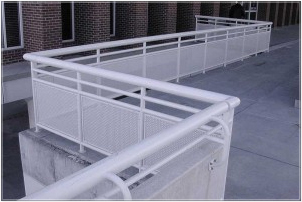 Aluminum Exterior Railings, Seven Line Fully Welded & Clear Anodized. 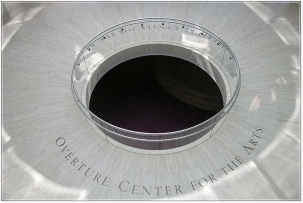 Overture Center for the Arts, Madison, WI. 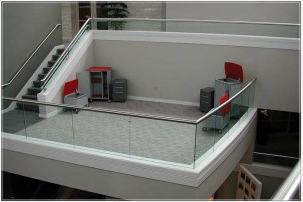 Tempered Glass and Stainless Steel Guardrails. Penn State University. 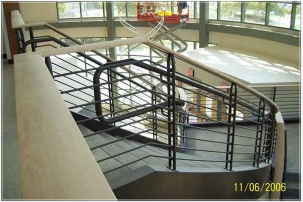 Painted Steel and Stainless Steel Cable Railing with Cap. Petoskey Casino, MI. 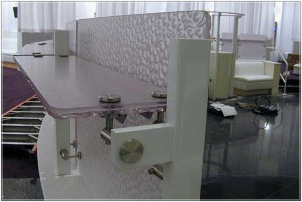 Custom Divider railings at Lounge. Private Residence, Ada, MI. 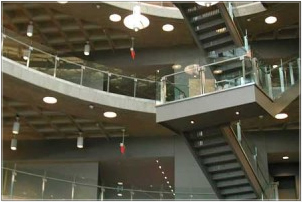 Perforated Stainless Steel Infill Panel Railing System. Richmond International Airport. Welded Aluminum Exterior Guardrails with Perforated Aluminum Sheet. Somerset Mall, Troy, MI. Ornamental Glass, Stainless Steel and wood Guardrails. Iniversity of Toledo College of Pharmacy. 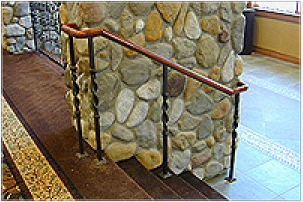 Custom Steel Railings with Wood Handrail Cap. Wharton Center, Michigan State University. 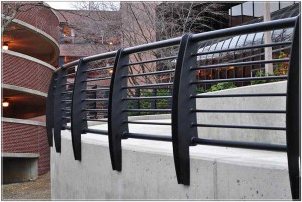 Curved Galvanized Guardrails 8-Line Steel with Painted Finish. The Shops at Willow Bend, Plano, TX. 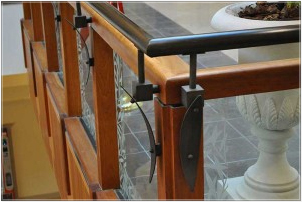 Tempered Glass Rails with Cherry Wood and Aluminum Cap Rail. Western Michigan University, Kalamazoo, MI. 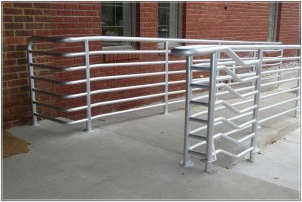 Custom Aluminum Railings with Powdercoat Paint Finish. Western Michigan University College of Health & Human Services. Tempered Glass, Aluminum Guardrails With Wood Subrail.